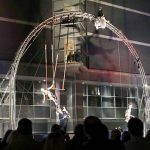 Urban Angels Circus is a contemporary circus company creating extraordinary aerial shows for festivals, nightclubs, corporate engagements, charity dinners and private events. We employ gifted costume and make up artists design to create a unique and enthralling high quality look for our characters. 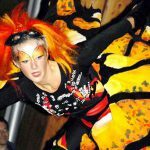 All our performers are highly trained aerialists or professional dance, circus and physical theatre artists. As well as our off the peg range we love the challenge of working to commission. Glastonbury Festival, God’s Kitchen, Opera North, Global Gathering, The Chamber of Commerce, First Direct, The Edinburgh Festival. Further afield, we have worked in Guadeloupe, Martinique, Spain, Bosnia & Greece. 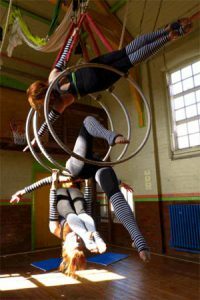 Urban Angels Circus offer tuition in Aerial Hoop, Solo and Doubles Trapeze, and Silks on a regular basis. 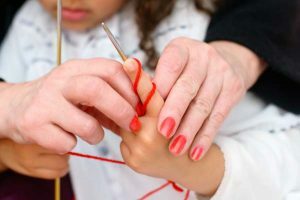 They also teach more unusual aerial skills such as Spanish Web, Aerial Net, Bungees and Harness Work as weekend workshops. 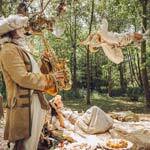 Our renowned conceptual performances with superb visual imaginary have been enjoyed throughout the world. 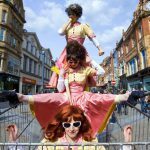 This quirky acrobatic trio combine static and promenade performance as they process in their giant shopping trolley. UAC produce high quality Living Statues and Living Tables. 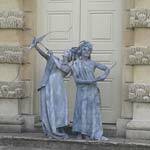 We have numerous delighted clients for whom we have provided elegant statues for private, corporate and charity events. 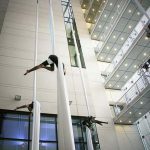 In addition to our teaching and performance work, sister company Urban Angels Aerial have a large body of conceptual work. Urban Angels Circus create beautiful aerial cabarets from existing beams or rigging points or from either of our graceful aerial rigs. Whatever we create we create our standards are impeccable and our attention to detail is meticulous to ensure a spectacular performance creating a long-lasting impression on your clients. Team building and circus skills workshops available. Risk assessments, method statements and full public liabilities insurance supplied.